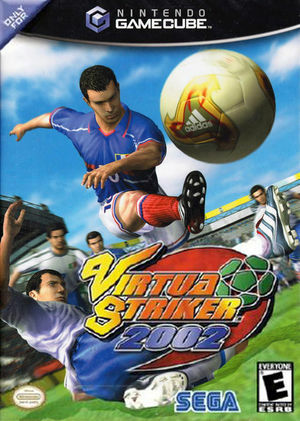 Virtua Striker 2002 also known as Virtua Striker 3 ver. 2002 is an arcade-style soccer video game by Sega. Virtua Striker 3 was released for the NAOMI 2; subsequent installments (Virtua Striker 2002 and Virtua Striker 4) use the GameCube-based Triforce hardware. There is an unlockable team called FC Sonic. This team is made up of Sonic, Tails, Knuckles, Amy, Dr. Eggman, four Neutral Chao, a Dark Chao, and a Hero Chao. FPS and VPS on dual-core processors is not 100% accurate (in some parts of the game). Dolphin may crash while playing Virtua Striker 2002 and give you a "GFX FIFO" error. To remedy this, enable single-core. Partially fixes fonts and logos. The graph below charts the compatibility with Virtua Striker 2002 since Dolphin's 2.0 release, listing revisions only where a compatibility change occurred. This page was last edited on 27 February 2018, at 10:54.